On what turned out to be one of the warmest weekends of the year, 22 young fly-fishers from all parts of England came together to try and reach the last 14 and go through to represent the country in the international arena next year. The competition was as hot as the weather. Ironically, the near perfect conditions of the Saturday and tales of big bags and confident chatter gave way to toil and sheer determination on a Sunday better suited to sunbathing than fly fishing. Nevertheless, good fishing was had and whilst it was predominated by sinking lines and the “brighter side” of tactical fly life, those that studiously fished in and around the surface with a more imitative approach were rewarded for their efforts. The maturity displayed by the young anglers was remarked upon by the volunteer boatmen who gave up a Sunday to chaperone aspiring young England fly fishers and guide them around over 1,000 acres of reservoir in the Cambridgeshire countryside. The event, hosted by the national governing body the Angling Trust and sponsored by Greys Fishing, could not have run so smoothly had it not been for the help of many selfless volunteers and family members of the participants who helped organise a barbecue to round off the event. The organisers expressed their great gratitude to the Grafham fisheries team who helped the event run seamlessly, with charm and attention to every detail. 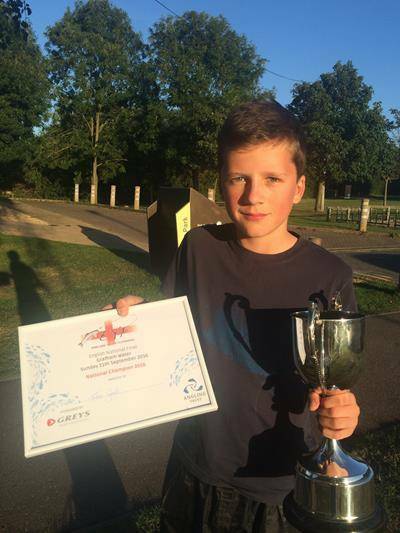 Special mention must be made of the eventual winner, Felix Gould, who caught a staggering 8 fish and secured a time bonus, just finishing ahead of Ryan Campbell who took slightly longer to catch his limit. Ben Fox, with 7 fish and third place was another admirable result. We are also thrilled to welcome another young lady into the team for 2017 – Natalie Bullock who will join Jess Tweddle from the North East, a past England cap proving that fishing is by no means a male preserve. The 14-strong squad for the search for gold in 2017 has now been assembled and we all eagerly look forward to the International Finals at Llyn Brenig in just under a year’s time. Next Tuna found 30 miles up the River Severn!